Recently stricken by two strong earthquakes registering above seven on the Richter scale, Turkey was awakened to eternal liberation! 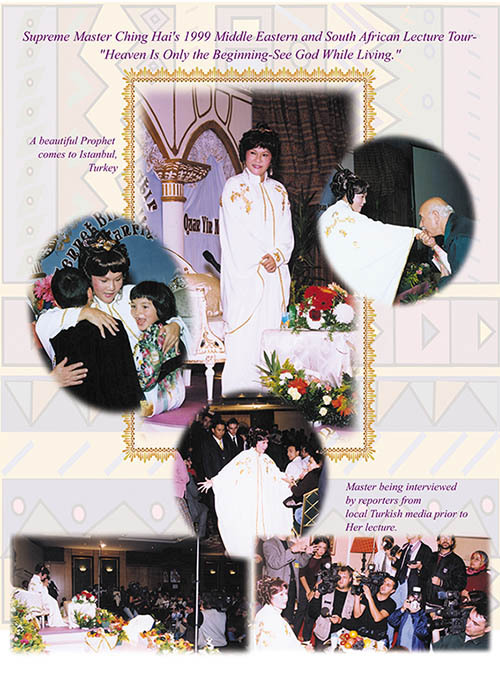 The sincere inner longing of the Turkish people drew Supreme Master Ching Hai to hold the first lecture of Her Middle Eastern and South African Lecture Tour in Istanbul on November 20, 1999. Istanbul is a large city with a population of approximately 10-15 million, lying on land that stretches between the Black and Mediterranean Seas. The city has many mosques (Muslim temples), each surrounded by four towers pointing toward the sky. These towers, called 'minarets,' are used for announcements that remind Turkish Muslims to start their routine of prayers five times a day. Teams of practitioners from different corners of the world worked together in many areas of Istanbul to distribute flyers, introduce Master Ching Hai and the Quan Yin Method to the people, and provide information about Her Lecture Tour. Most of the Turkish people we met were very friendly and gladly received the flyers, curiously inquiring about Master and the Quan Yin Method. Some young Turks even took the flyers to pass out to their own people, speaking eagerly in their own language. Finally, the lecture day arrived and by 5:00 PM, the room was packed, causing others to go to another hall upstairs to watch Master on a big screen TV. The stage, decorated with Muslim mosque-like arches made of wood and painted white, was filled with flowers, fruits, and candy. 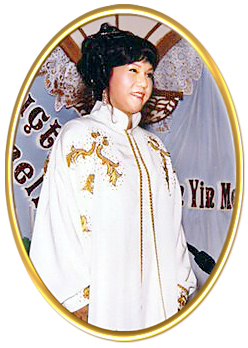 When Master arrived in a flowing white outfit with sparkling gold trim, Turkish television and newspaper reporters first demanded an interview before allowing Her to proceed with the lecture. When She finally entered the lecture hall, many crowded around Her to touch or shake Her hand. Before Master spoke, the audience stood and sang their national anthem, creating an atmosphere of national pride and poignant emotion. Master touched their hearts immediately by greeting them in Allah's name and praying that God would help Turkey by minimizing the country's disasters and suffering. She said that love is the only religion, and offered the audience the Quan Yin Method that would allow them direct access to Heaven and the realm of the angels, as experienced by the Prophet Mohammed in a cave outside Mecca. Reciting a famous phrase from the Koran, Be a good guest on this Earth, Master reminded the audience that they can "borrow" a house, a car, a wife, a husband, children, etc., but to be good guests in this world, they have to remember the missing part, which is how to connect directly with God. Drawing a large circle that symbolized God, Master pointed out that all created things in the universe are part of this circle and nothing is outside this circle, not even the Devil! She held up a yellow pad of paper, a black pen, and a red pen, saying that if a soul occupies the yellow pad, it calls itself the "yellow pad," if it occupies the red pen, it calls itself the "red pen", etc., meaning that physical forms can be different, but all of these forms are within the Godly "circle". And the Father knows and cares for each and every individual, and each is a part of Hirm. Master added that it is important not to harm one another because God knows everything, and since each of us is within the circle, we cannot hide. She explained that in actuality there is no reincarnation, but just the soul using one form until that physical form is "kaput", then jumping to another form to continue its experience as a different part of God. The "jumping" from one form to another is called "death". As souls, we need to detach from the physical form and from the names we associate with to be liberated. Following Master's lecture, hundreds of Turkish people stayed to learn the Convenient Method or receive initiation. Allah at last had sent a "beautiful" Prophet to sow the seeds for the future era of Turkey!